It is a condition where the number of red blood cells in the blood is low, thus causing a low blood count. It occurs because your red blood cells do not contain enough hemoglobin, a iron-rich protein that causes blood to be red in color. Active bleeding, eg. heavy bleeding during menstration. 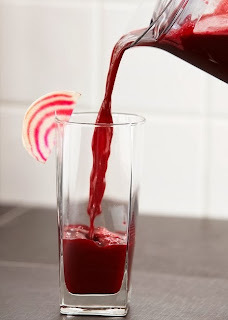 Beetroot juice is possibly the best natural remedy for anemia. It contains excellent cleansing properties with a high iron content that restores red blood cells whilst supplying oxygen and increasing the blood count. As a valuable source of iron and beets are an excellent natural source to reverse anemia. It is of great benefit to women during their menstrual cycle and those going through the menopause. It is recommended that you drink one pint daily of blended beet juice. The base blend should be with carrot juice but you can add apples, pineapple, coconut flesh, spinach or cucumber depending on what other ailments you want to cure. Beetroot should only be used in its raw state. That is because the powerful betalain it contains is reduced during cooking, and oxalic acid crystals are released forming calcium stones when heated. Using cold water wash and brush the vegetables with a stiff vegetable brush. Depending on what texture you want, you can either juice or blend the ingredients. In blending you will use all of the vegetables, nothing is thrown away and the drink willl have a smoothie type texture. Warning: Do not drink beet juice in great quantities as it is very powerful and can make you feel sick. Combine beet juice with a base juice like carrot juice. eg 2oz of beet mixed with a 8oz of carrot juice. If you drink beet juice on its own do not drink more than 3oz at any one time.